Are You Looking for Color Contacts in Cincinnati, OH? Did you ever wish your eyes were a different color? We carry many color contacts at our Cincinnati optical, to provide you with a choice of a vibrant new hue, or a more subtle enhancement of your eye’s natural pigment. Optometrists at Timothy P Kenkel and Associates recommend Air Optix® Colors for color contact lenses. Alcon / CibaVision manufactures AirOptix Colors. They produce high quality contact lenses, which are safe and comfortable. Their Air Optix® Colors contact lenses live up to Alcon’s trusted reputation. 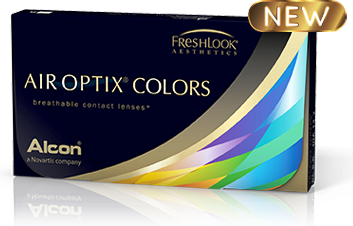 For “stunning eye color that feels as good as it looks” try Air Optix® Colors from your Cincinnati optometrist. Colored contacts are made from high quality contact lens material, so your eyes can still breathe when you wear them, allowing you to wear your contacts longer with less irritation. Some other color contact lenses have added thickness and a palpable texture, but Air Optix® Colors are smooth. Whether you need vision correction or are just interested in the fashion aspect of color contacts, color contact lenses are available with or without a prescription. Even if you have 20/20 vision and do not need contact lenses to see, you can still change your look with a pair of non-prescription color contacts. Of course, if you do wear prescription lenses, you can get these color contacts customized with your unique prescription for fantastic fashion statement and ultimate vision correction in Cincinnati, OH. When you wear color contacts, they should look natural, even if the new color is totally different from your natural eye color. By combining three colors in one, Air Optix® Colors contact lenses achieve a perfect balance, blending naturally with the color of your eye. Since they are made from the same great material as monthly Air Optix® Aqua contact lenses, so Air Optix® Colors can be worn for up to a month. If you’re looking for color contacts in Cincinnati visit us at Timothy P Kenkel & Associates.